Hummus is one of my favorite gluten-free snacks. My husband and I have two to three containers in our refrigerator at any given time. While delicious on its own, scooped up with sliced fresh veggies or gluten-free crackers, hummus is also tasty dolloped on top of salads and slathered on sandwiches in place of mayo/mustard. Versatile, healthy, naturally gluten-free...and so easy to make at home. Making hummus from scratch is simple and easy. Chickpeas, tahini (sesame paste), and garlic are pulsed with a food processor until the ingredients come together. Water or aquafaba ("juice" reserved from the can of chickpeas) is slowly added to the running food processor until hummus is silky smooth and reaches desired consistency. Season to taste with salt and pepper and drizzle olive oil over top as a final garnish. 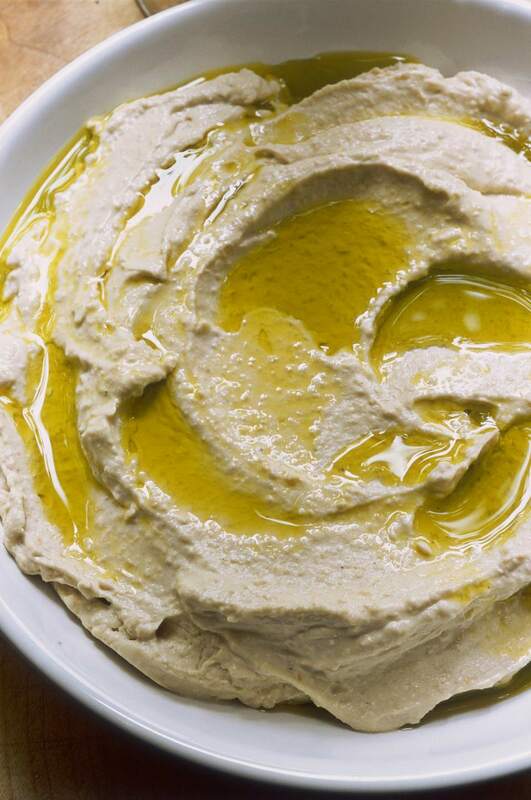 This basic hummus recipe is like a blank canvas. Mix in additional herbs, vegetables, and seasoning to flavor the hummus in delicious, creative ways. Lemon juice and fresh basil are my favorite ingredients to add to homemade hummus. Bright, flavorful, and reminiscent of summer. Before serving, I drizzle olive oil over top the hummus. If I have them on hand, I'll sprinkle toasted pine nuts and freshly chopped basil over top as well. For a super silky smooth hummus, I take ten minutes and remove the skins from each garbanzo bean. It sounds like a tedious task, but it goes by quickly, especially if you have extra hands to help you (get the kids involved!) The hummus texture is so much smoother without the skins, dreamy and silky. It's certainly not a necessary step, but if you've never made hummus without the skins before, give it a try and see which you prefer! Place chickpeas, tahini, basil, lemon juice, and garlic in a bowl of a food processor. Pulse until ingredients are coarsely chopped and come together. With the food processor running, slowly add the tablespoon of olive oil followed by reserved chickpea juice until hummus reaches desired consistency. (You do not have to use all the reserved juice. I only used about half). Season hummus with salt and pepper, to taste. Pulse again until smooth. Scoop hummus into a separate bowl or serving platter. Garnish with remaining tablespoon of olive oil. Serve immediately, or refrigerate before serving. Our Favorite Bean Salad Recipes are All Gluten-Free!